How Can I Choose a Quality Online Master’s in Public Health Program? Public health is a multidisciplinary field of professional practice that spans work in diverse areas such as epidemiology and community health. Careers in the industry are growing rapidly considering an aging population, growing demand for healthcare services, technology integration into healthcare service delivery and advancements into disease research and prevention. Earning an online master’s degree in public health can position you for success in your personal area of professional interest and provide you with the skills necessary to transition into an advanced career path. UNC’s fully online Master in Public Health degree allows health industry professionals worldwide reach the next level in their career without going to class. The program is designed for students with a few years work experience in a relevant field and a professional diploma, or for students with a related undergraduate degree. Utilizing an accelerated semester timeline, students must take at least two courses over a period of seven semesters. Studying throughout summers, the program generally takes two years to finish. Course curriculum includes core public health classes, 12 credits of focalization, a graduate research paper and a practicum. Public health students ready to earn their graduate degree can do so through diverse opportunities offered by the University of Minnesota. The university’s School of Public Health provides seven academic tracks within the Master in Public Health degree program, all available as face-to-face and full-time programs. For students with who cannot attend campus full-time, distance learning options are available, mixing online courses with accelerated in-person classes. Through a partnership with ASU, students can earn their University of Minnesota MHP while attending ASU. Most MHP programs demand an internship experience and can be completed in two years. Tulane University has nine areas of concentration available within the Master in Public Health degree program. All nine paths to achieving graduate honors in public health at Tulane demand the completion of 45 credits, a practicum and “culminating experience”. Credits are divided among core, public health classes that all students must take, specialization classes and a number of electives. Students may complete 250 or more real-life experience hours as part of their practicum. The number of hours is dependent on the student’s focus. The culminating experience segment requires students conduct research and report their conclusions in a thesis. DePaul University was founded in 1875 and today is the nation's largest Catholic university, serving more than 7,000 graduate students. The Master of Public Health (MPH) degree program focuses on health promotion and disease prevention in a community health practice. The 56-hour MPH degree is structured around fourteen required classes and two electives. Students can complete the degree in two years or as many as four years. In the final year, students must complete a capstone course and their practicum (field experience). Applicants must apply online by March 1 to qualify to enter the program in the following fall quarter. Northwestern University’s Master in Public Health (MPH) degree offers potential students considerable flexibility. It is offered in a one-year accelerated format or as a part-time evening program. The one-year program is designed for students who can commit to a year dedicated to learning and practical experience. The evening program was created for public health professionals seeking advanced credentials. The generalist degree is for students targeting studies for a wide range of careers in public health practice and advocacy. Other degree options include concentrations in Community Health Research, Epidemiology, and Global Health. Students must complete coursework, required field experience and a final project. East Carolina University launched its graduation programs following state approval in 1929. Today the university offers more than 70 master’s degrees. Students can pursue a 45-hour master of public health (MPH) as an interval degree taken during the second and third year of medical school. Some 254 hours of the degree focus on core studies and students are required to complete a professional paper and internship of 240 contact hours. Entrants must choose a specialization in Analysis and Management (A&M) or Health Behavior (HB). Instruction includes online courses and face-to-face interactions. Loma Linda University’s faith-based College of Medical Evangelists was transformed into the School of Public Health in 1964 when it began offering master’s degree programs. 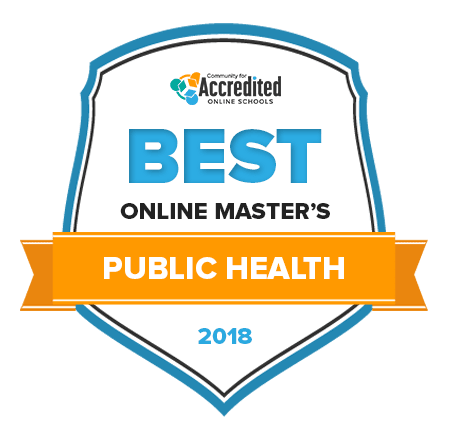 Today’s online Master of Public Health (MPH) degree program offers students a choice of concentrations, including: biostatistics, environmental and occupational health, epidemiology, global health, health education, health policy and leadership, lifestyle management, nutrition, and population medicine. The program can be undertaken on a full-time basis or in a part-time format for working students or parents. Completion requirements include a 400-hour project conducted at a LLU-approved public health setting. Online components are delivered by the CANVAS course management system. Established as South Carolina College in 1801, today the University of South Carolina-Columbia with its nearly 50,000 students is the flagship institution of the University of South Carolina system. Classes for the 45-unit Master of Public Health degree program are delivered online via the Blackboard system that utilizes group projects, video conferencing, chat rooms and discussion boards. The degree can be completed in just over two years. To complement the online core courses and public health focus, the university requires the completion of six units of practicum seminars and fieldwork. Both the generalist and professional concentrations in the Master of Public Health at the University of Illinois at Urbana-Champaign are offered in campus or online formats. The 48-credit generalist degree is comprised of 28 hours of coursework, 20 hours of electives, and a four-hour professional internship completed with an approved health organization. A final exam is required. An MPH 36-hour option is available for physicians and doctoral holders with at least a year of professional experience. The option includes 28 hours of core courses, eight hours of general electives, and an internship. Founded in 1855, Michigan State University was the prototype used by the United States in developing land-grant universities. Today, the Flint campus is home to the College of Human Medicine’s Division of Public Health. The 42-credit Master of Public Health is considered to be a terminal professional degree. The program is built around 19 credits in online core classes and 18 online elective credits. Final requirements include completion of a Capstone paper and a 240-hour practicum that can be undertaken at an approved facility anywhere in the United States. All academic advising is delivered exclusively online. Online master’s in public health (MPH) blend theory, research and applied learning to provide you with a comprehensive understanding of public health issues. It is a diverse field of study that allows you to customize your learning experience in several specialized areas, such as epidemiology, global health, environmental and occupational health, health services administration and more. In most cases, the faculty and curriculum are the same between online and campus-based MPH programs – only course delivery differs. However, it is important to note that some online MPH programs have residency requirements where you must make one or more on-campus visits. What Common Courses are Offered in a Master’s in Public Health Program? No two MPH programs offer the same curriculum, but you may expect to take some of the courses listed below. This course covers the foundational principles of social and behavioral research methodologies used within public health. Students study both qualitative and quantitative approaches, such as conducting experiments, observational studies, and more. Students study the history of public health and its institutions and explore how health care delivery systems have changed over time in response to different challenges, such as infectious diseases and natural disasters. Students examine the environmental factors (e.g. physical, biological, chemical) that impact human health at the individual and community level. In addition to health factors, the course introduces students to state and federal regulations and emergency preparedness operations. This course introduces students to the process behind public health policy development. Students develop skills in policy analysis and advocacy, learning how to use evidence-based frameworks to examine and review public health policies. In this course, students are exposed to the central principles and functions of effective health care organization management. Students gain an understanding of health organizations, including human resources, strategic planning, financial resources, and performance management. What Specializations are Available in a Master’s in Public Health Program? When considering an MPH, you should examine what type of professional you want to become (e.g. researcher, clinician) and in what area you want to practice (e.g. behavioral health, disease prevention). Although specializations vary from program-to-program, below is a list of some of the most common academic concentrations in MPH degrees. Students develop skills in statistical methodologies that can be applied in public health areas such as medicine, biology, biomedical sciences to monitor the health status of different populations. Students integrate research, policy and public health practices to enhance their skills in community-based assessment and evaluation to devise solutions to chronic health issues research. Students learn how to conduct environmental risk assessments and identify vulnerable populations and devise solutions to biological, physical and chemical risk factors that could negatively affect human, animal or environmental health. Students gain skills in research analysis, learning how to use a variety of software tools to analyze public health data and create actionable research insights into issues such as HIV/AIDS or cancer. Students develop an understanding of the challenges of health service delivery and learn how to use management principles to lead and improve public health systems. As a student in an online MPH program you will be required to complete a supervised internship – also called a “practicum” – at an approved local or national organization. This component is vital to providing exposure to real-world situations and helping you develop applied skills as a public health practitioner – whether in policy analysis, epidemiology or health promotion. Practicums last multiple weeks and are supervised by a faculty mentor and you coordinate with partner organizations such as nonprofits, state health agencies or hospitals to complete your practicum project. The diversity of graduate education in public health means you should review your options before deciding. This review should include the program’s accreditation, classes sizes and instructors and residency requirements. First, the program should be accredited by the Council on Education for Public Health (CEPH). This accreditation means the MPH program itself – not the university – satisfies minimum levels of academic quality and standards. Like a campus-based program, the class sizes and student-to-instructor ratio can also impact the learning experience in an online environment as well. Inspect the MPH program class sizes and ratios to ensure you will receive individualized attention and opportunities for collaboration with classmates. Finally, be sure to check the residency requirements. As noted above, most online MPH programs require you to travel to campus one or more times. This travel means you might have to adjust your school selection based on your proximity to the institution’s physical location. Completing an MPH degree allows you to pursue employment avenues in a variety of disciplines, such as education, mental health, substance abuse, community health, disease research, and public policy. Because of this diversity, you can use your MPH to land positions in research, academia, government and nonprofits and private industry. Below is a list of potential career paths for graduates with a master’s in public health to consider. Biostatisticians designs, execute and analyze clinical studies in different public health arenas (e.g. medical device manufacturing, community health research) to develop products such as pharmaceuticals or assistive medical technologies. Environmental scientists are researchers that conduct surveys of natural environments (e.g. soil, rivers) to identify potential threats to human, animal or environmental health and develop recommendations to preserve ecosystem and prevent harmful environmental practices (e.g. dumping chemicals). Epidemiologists are investigative public health researchers that conduct research to identify patterns and trends of diseases – such as cancer – and create recommendations that can be used to develop strategic plans to combat those issues. Healthcare administrators work in leadership roles throughout the healthcare system and use their knowledge of operations management, human resources and fiscal controls to ensure healthcare services are coordinated and delivered in a quality manner. Health educators work in community health settings to develop informational materials and programs to advocate for health behavior practices, consult with individual clients and families and serve as public health policy advocates. What’s the Expected Job Outlook for Public Health Careers? The healthcare industry is one of the fastest growing industries in the country. In fact, the Bureau of Labor Statistics projects national job growth of 18 percent for healthcare professionals between 2016 and 2026. That represents 2.4 million jobs and many of them are within the field of public health. In part, an aging population, the increasing demand for scientific and technological innovation, along with greater recognition of health prevention and disease research are placing a greater emphasis on the need for qualified and trained public health professionals. There are numerous associations and organizations in the field of public health. These groups offer different student member benefits, including annual conferences and access to peer-reviewed journals, scholarships and grants, career listings, online resource webinars and more. The APHA represents more than 2,500 public health professionals, hosts conferences, organizes professional development programs through a career center and publishes the American Journal of Public Health. APHA is a nonprofit organization that advocates for public health policies, offers continuing education programs, internships and a public health board. Founded in 1979, the ACE supports epidemiology professionals through publications, scientific meetings and conferences, professional development opportunities, and industry awards. The leading association of K-12 school health education professionals, the ASHA publishes an industry journal and provides continuing education programs and hosts conferences. SOPHE provides annual awards, fellowships and scholarships to health education students, faculty and practitioners, offers continuing education programs, hosts conferences and networking opportunities for members. Whether the goal is to become an environmental scientist studying cardiovascular disease factors in low-income neighborhoods or an epidemiologist researching infectious diseases in Sudan, the cost of an online MPH should not be a barrier to completing a degree. There are numerous funding avenues for you to consider when it comes to paying for their MPH. Below is an overview of some of those options. You should submit a Free Application for Federal Student Aid (FAFSA) to determine if you are eligible for any federal financial aid. You may also take out loans from the U.S. Department of Education. Public health associations traditionally offer scholarship, grants or fellowship programs to their members. For example, the Association of Accredited Public Health Programs offers two graduate student project scholarships annually. Most MPH departments offer scholarships for new and continuing graduate students of public health. Sample scholarships include this list of named scholarships for students in the College of Public Health at the University of Arizona. There are hundreds of public health associations, societies and academies in specific areas of public health (e.g. biology) that support public health education via scholarships and grants. Examples include the Robert D. Watkins Graduate Research Fellowship from the American Society for Microbiology.